"Delicious, roasted cabbage! I apologize for not having a measurement for you! I do not typically measure. If anybody tries this and would like to give tips on measurements, please feel free!" 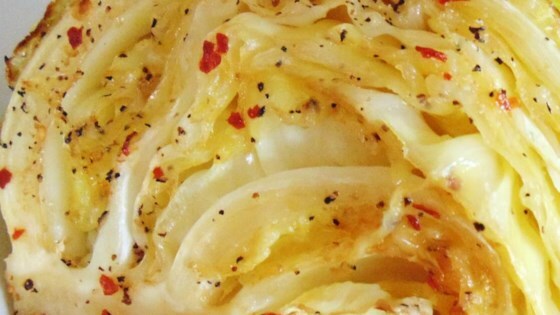 Brush both sides of each cabbage wedge with olive oil. Sprinkle garlic powder, red pepper flakes, salt, and pepper over each wedge. Arrange wedges on a baking sheet. Keep the core attached to the cabbage when cutting into wedges to help it hold together. Perfect! Baked at 425*, tented with foil, for 20 minutes and then removed and continued to roast for 20 more minutes. Excellent with our red beans and rice dinner. Thank you! I followed the other reviews and tented the cabbage for the first 15 minutes, and then flipped and roasted without cover. Delicious and easy!